Cancer Fun Time! : Happy Birthday! Have a Nap. 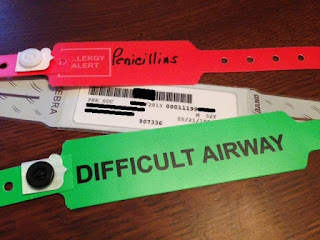 It so happened that when I consulted the otolaryngologist, Doctor B, back on May 10 and we determined a biopsy was necessary, Doctor B's next available surgery date was May 21. My Birthday. Because he needs to dig around at the back of my tongue and if he did that while I was awake I would "yack all over him" (his words), we have to do it under general anesthetic. So today I went to the local hospital for "Day Surgery". The prep protocol was pretty simple: don't put anything in my mouth after midnight the night before. Not even water (which seems pretty weird). Then be at the hospital at 10:15 AM for a 12:50 PM procedure. So we celebrated my birthday with cake a day early. When I checked in there was of course some paperwork to fill out. After a bit in a waiting room with other patients and family members a nurse took me into an exam room and did the usual blood pressure/pulse/temperature thing. Then she gave me a nice new outfit to wear: gown, scrub pants, slipper socks and a robe. Don't I look handsome? Then back to the waiting room for an hour or so. It occurred to me that they probably schedule this way so that if a surgery is cancelled the next patient is already present and prepped and they can fill the gap and prevent the surgical team from being idle. Finally it was my turn to go to the pre-op area. I said good bye to Wonderful Wife; she'll return in 3-4 hours to retrieve me. The preparation materials the hospital had given me told me that I would be asked my name and birthdate many times during my short stay. They were not lying. Probably 15-20 times. That's just fine with me. I don't want them taking out my kidney by mistake. A very sweet nurse came and set up my IV and put on a bag a saline. I started mentally tallying my puncture count, because I'm pretty sure by the end of this whole cancer thing it's going to be kinda big. During my time in the pre-op area all of the members of the surgical team came by one at a time to introduce themselves and ask me a different set of questions. They were all quite friendly. Except for the anesthesiologist. She was kinda grumpy. I love to observe systems and discern how they work. I was situated in a great place in the pre-op area for that. Right across from me was a door marked PACU. For some reason it is marked as such with four individual magnetic letters stuck to the top of the door frame. I watched unconscious people wheeled past me and into that room periodically so I figured it's a recovery room. I asked the nurse at one point what PACU stands for. "Post-anesthesia Care Unit." Near the foot of my bed was a cart with a computer monitor on top. After watching my anesthesiologist and a couple of other people us it, I figured out that it is a portable pharmacy for securely dispensing narcotics. She logged in and typed some stuff, and then one of many small drawers in the cart below the monitor would pop open containing a single syringe. Those meds are popular with the Michael Jacksons of the world, so they are tightly controlled. I thought it was fascinating that there is a special cart for that. Doctor B came around for a chat, accompanied by Medical Student. We reviewed what he was going to do. I reminded him of my request to get enough tissue for sequencing, which was a good thing because he had forgotten. I gave him Foundation Medicine's URL and told him how to find the sample collection guidelines. He and Medical Student went off to read that. Finally it was my turn. The very last thing they had me do was sign consent for the procedure. 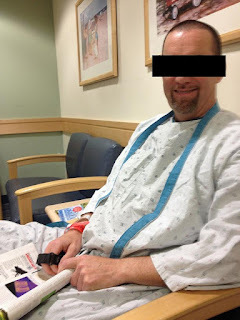 Then the anesthesiologist injected her syringe into my IV and they started wheeling me toward the OR. I was mentally tracking the effects of the drug. I felt completely aware for about 20 seconds while they wheeled me past the pre-op nurses' station and passed through the door into the OR. Then things got foggy and I barely remember moving from the gurney onto the operating table. Then it was lights out. Maybe 30 seconds total from injection to loss of consciousness. The first time I woke up it was 2:55. I was in the PACU. My own personal PACU Nurse was at my side. Then lights out again. I woke up again 10 minutes later and then fell back asleep. 10 minutes later I woke up again and this time stayed awake longer. There was a mask strapped to my head delivering water mist. Finally by about 3:35 I was awake for good. That waking process was mildly unpleasant. Kind of like when a limb is asleep and it won't wake up as fast as you'd like. I noticed that even when PACU Nurse wasn't at my side she was sitting across the room but watching me closely. I eventually figured out that there was a 1:1 ratio of PACU Nurse to patient in this room. My PACU Nurse only watched me. Doctor B came by to talk to me about the procedure but I was only semi-conscious and barely remember it. The only thing I remember is that he told me he took plenty of tissue for sequencing. At 3:55 they moved me to a less instrumented and staffed recovery room and installed me in a comfy chair and called Wonderful Wife to come retrieve me. I thought I was feeling pretty normal but that was only until I started moving. Even just the wheelchair ride to the exit made me a little queasy. By the end of the 10-minute ride home I was feeling pretty bad. We stopped and got a milkshake on the way and I think that didn't help. It would be 8:00 PM before I felt normal again. Now the wait begins. I expect the pathology results will be available in two or three (Thursday or Friday). Everyone get everything he wants. I wanted a prognosis, and for my sins, they gave me one. Having what is more likely a Stage IV throat and neck cancer, originally a huge lump in the base of the tongue, now with metastases in lymph glands in the chest and along the esophagus couple with mets in the lung. 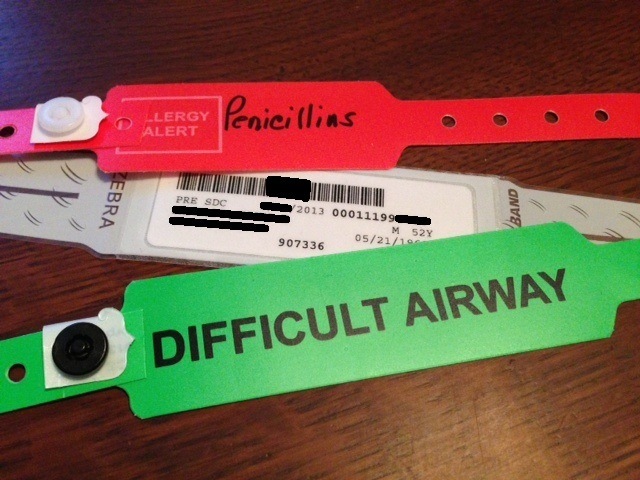 After a recent CT-scan I asked my oncologist whether there was any need for my planning for the coming summer, and she answered something like:"not really"..so I get to think:"well, easter holiday is good too", but really, getting this prognosis or summary dismissal of a future did not help my quality of life significantly. So, be careful what you ask for! You may just get it..